Crisp on the outside – fluffy on the inside! 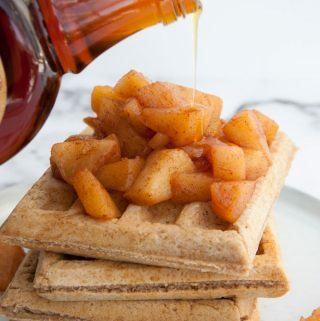 These perfect vegan Apple Pie Waffles are topped with warm apple chunks and drizzled with maple syrup. 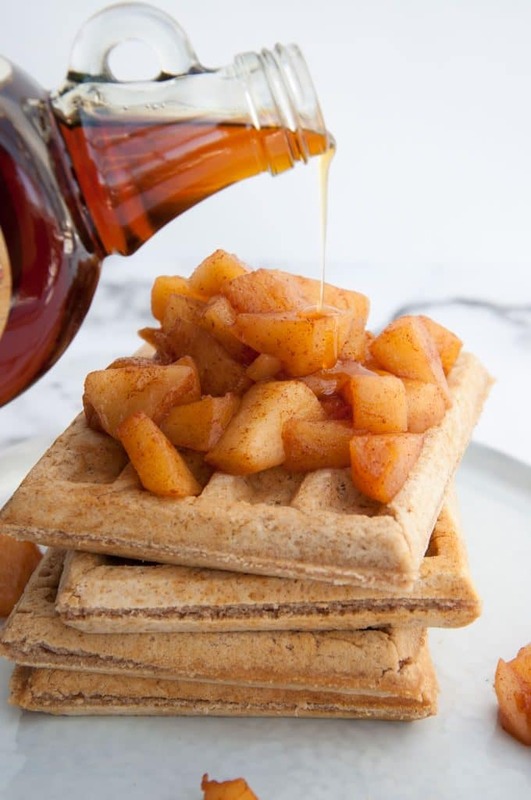 If you love apples and apple pie – you’ll love these Apple Pie flavored Waffles! 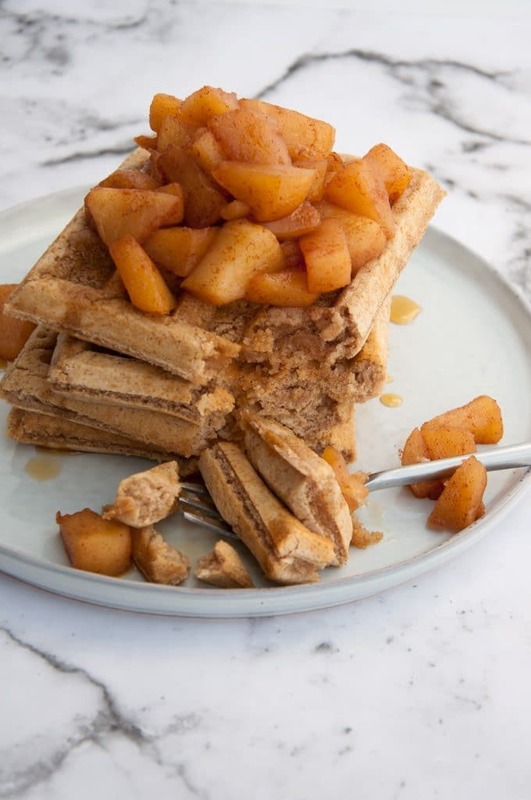 There’s cinnamon and ginger powder in the waffles and the whole stack of deliciousness is topped with a warm apple chunks cooked in cinnamon. And of course: Maple Syrup. Lots of maple syrup! The recipe is enough for 4 belgian style waffles. If you use another waffle iron – you might end up with more or less waffles. Crisp on the outside - fluffy on the inside! 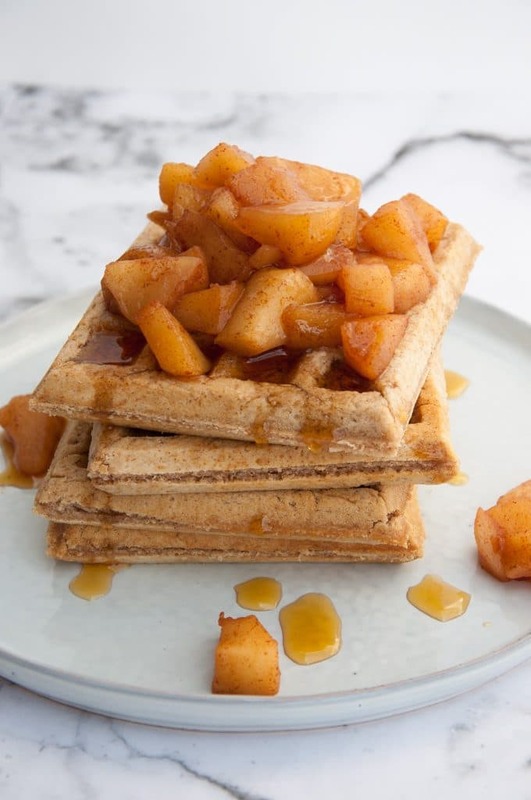 These perfect vegan Apple Pie Waffles are topped with warm apple sauce and drizzled with maple syrup. For the apple sauce, put all the ingredients in a pot, bring it to a boil and let it simmer with the lid on for about 20 minutes. Then take the lid off and let it simmer for another 5-10 minutes. Let it thicken up a bit. Combine the flour, cinnamon and ginger powder, baking powder, sugar, and salt in a mixing bowl. Add the coconut oil and rice milk and whisk until combined. It should be a thick, sticky batter. Heat the waffle iron and spray it generously with the oil, so that the waffles don’t stick to the iron later and add about 1/4 of the waffle batter for each waffle and let it cook in the iron until slightly brown on the edges. Once you’ve made all the waffles, stack them up, spread the warm apple sauce on top, drizzle with more maple syrup and enjoy! 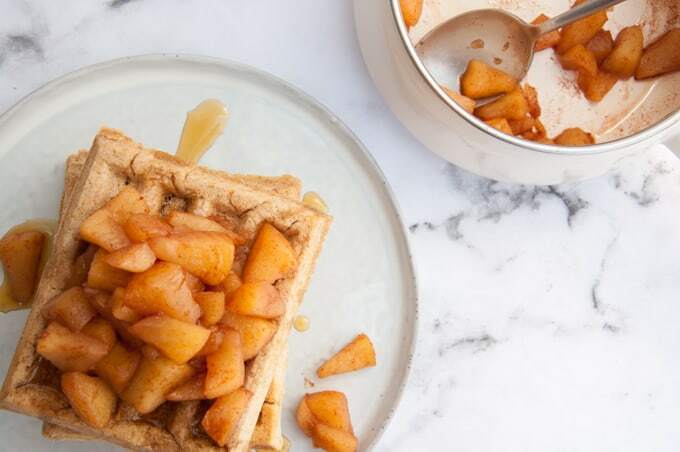 Did you give these Vegan Apple Pie Waffles a try? Tag @elephantasticvegan on instagram and use the hashtag #elephantasticvegan. Don’t forget to subscribe to the Elephantastic Vegan Newsletter to see Reader Remake Features!